But their efforts are not enough to make this hopelessly derivative horror film anything other than forgettable. (...) "Hannah Grace" is barely 85 minutes, with an ending so abrupt that you'll wonder whether you've missed something. A horror film set in a morgue, featuring a graphic-looking demon cadaver, may disappoint those who thought they were getting an exorcist flick. There's a morgue and a restless corpse, and that's kinda it for this scare-free horror movie. 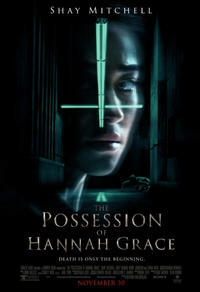 Overall, THE POSSESSION OF HANNAH GRACE is a clever twist on "Possession" movies that turns into a zombie slasher film by the third act.